Decorating a tiny space and making it feel cozy is not really a challenge, it's the staying organized part that is hard. With two lives worth of stuff to fit into one small space, I knew we would have to get creative. Having a piece of furniture or area of the house that only serves one purpose is for mansion dwellers. We needed more uses for less things. My favorite piece of multi-functional furniture we have is our couch. 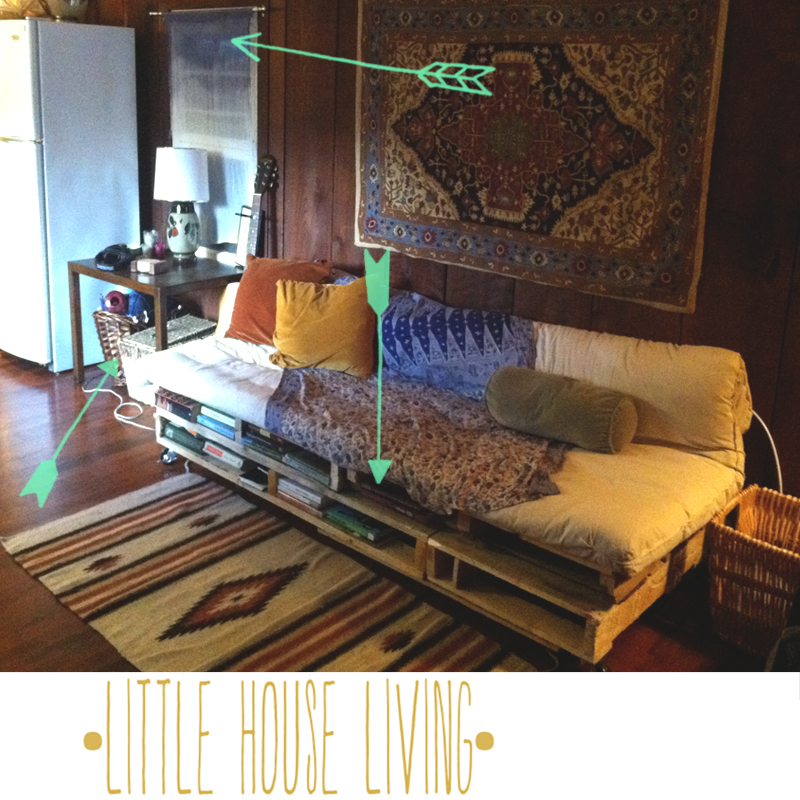 Joey built it for us out of shipping palettes and a futon mattress and we love it! Bonus: we use the slots underneath as a book shelf. 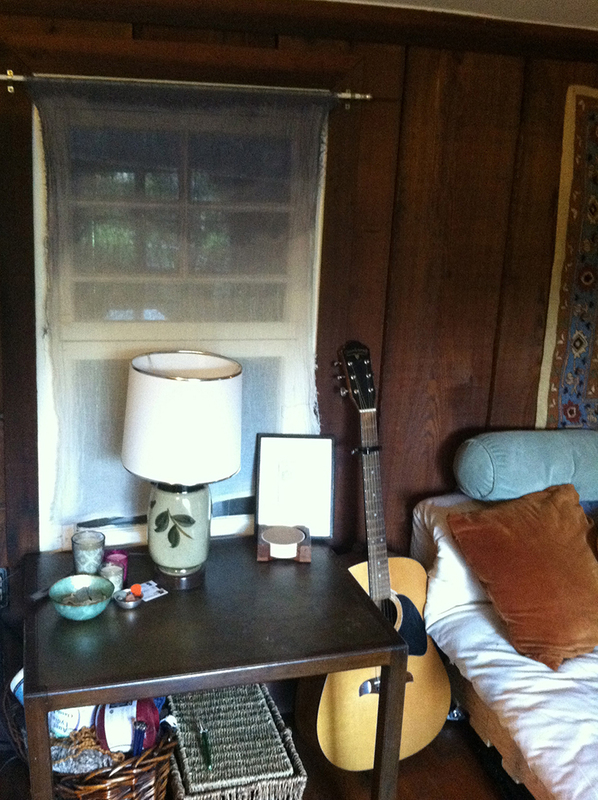 And that little table to the left of it is a brass-topped beauty that I found at a garage sale. Now it holds a lamp, some candles, fairy cards, gemstones, and some coasters while also hiding the baskets below it. Which brings me to baskets: the best and most attractive way to hide your belongings in a small space. These ones hold my weaving materials and other fiber bits, our terra cotta and stone clay collection, and extra boxes of tissue. The ones under our bed hold my makeup (the bathroom is a story for a different day) and all my extra purses/scarves/tapestries, and a bunch of Joey's things. I always find good ones at Ikea or Cost Plus World Market. 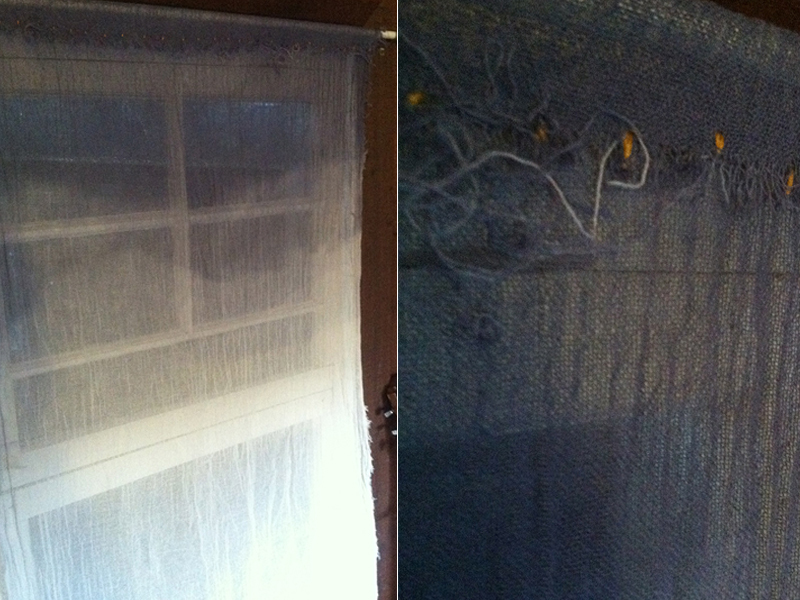 And now if you will direct your attention to the area just above the side table... this weekend I hand-dyed curtains! Two out of three of them were a success (not bad for my first try) and this little gauzy one is my favorite. I went for an ombre effect using a deep blue and then I folded over the top leaving the rough edge exposed and made some little golden stitches. The dying was a mess and not as easy as I had hoped, but I might try again.